The writer is web-mama and content coordinator at the House of Midwives. My baby suddenly turned into a breech position two weeks before the due date. This happened unbeknownst to me over night, even though the turning head down several weeks before was uncomfortable, as the baby was lodged sideways for days. It’s completely normal for the baby to change positions often when there is room in the womb – I was sure I had a carousel in my stomach for most of my pregnancy. The further my pregnancy progressed, the less space the baby had and I felt more like a boxing bag, because the baby was – and still is – a little dynamo. A stargazer breech is where the baby has the face turned up, as if looking at the stars. The stargze was visible in the ultrasound a few hours before the c-section and was probably a factor in the foot slipping out first. Why do babies turn breech? Naturally babies will always strive to settle into the best position possible. Halfway through the pregnancy the head begins to weight quite a lot and gravity encourages the baby to settle head down in the pelvis. However, I think there are about as many birth positions as there are babies. 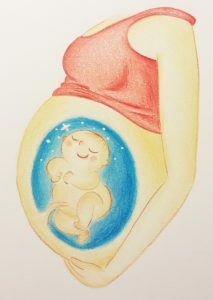 The reasons for a breech are often unclear and can be many, as I was explained to several times: the structure of the womb, more than one baby, location and structure of the placenta and the tensions and misalignments of the mother’s body, however small, affect the space available to the baby. I had an anterior placenta, went on sick leave from work at around the 5th month (a strenuous physical job wore down both body and health) and especially towards the end of the pregnancy I felt like an overfilled balloon. When my muscles and ligaments started softening in preparation of birth, I felt like a stack of poorly stacked building blocks. Moving around was very uncomfortable and exercise became impossible: I couldn’t even swim anymore because in the pool I just bobbed around like a sinking slug. When the heartbeat suddenly had shifted to above the navel at a maternity clinic visit, I immediately realised it was a breech. So I headed for an external cephalic version (ECV), the experiences on the discussion boards were 50/50 – “can’t hurt to try” I thought. With the guidance of Johanna we immediately began to work on turning the baby head down. I tried to give the baby more space by stretching and using gravity, acupuncture and moxibustion was also used. Always after a moxibustion session there was a lot of activity in the womb and I believe that if there had been enough space the baby would have turned head down. But the strains and tensions built up over several years did not have the time to release during those two weeks before birth. The doctor was very good, reviewed the situation and discussed options with me. The ultrasound showed that the baby was in an unfavourable position for an ECV. To successfully complete a version it would have been best for the baby’s back to be facing outwards, so that the doctor could grab hold of the bum and head. She said that suffering won’t make the turn any more successful, so if it hurt she’d immediately stop the procedure. The most important thing was for me to be as relaxed as possible. The ECV was attempted several times but the doctor never got a good enough grip on the baby, as she was resting with her back towards mine. The procedure in itself was uncomfortable but not painful. The doctor said that my stomach would most likely be sore and bruised from where she had handled it. Would I go for an ECV again? Honestly; no. My stomach was bruised and really sore after the procedure. Despite the breech I opted for a vaginal birth instead of a c-section and I could still feel in the birth how my stomach was sore. Because the baby slipped out her foot first, the whole show ended in a c-section anyway. In the c-section my poor, sore stomach muscles got stretched even more. On top of everything else I got endometritis that was very painful in itself, but was also made worse by the soreness from before. Women who start with a vaginal birth and end up in a c-section are in the highest risk group of getting post-op infections. The general attitude at the maternity clinic and hospital was panciky and a vaginal birth wasn’t even discussed until the ECV failed; vaginal birth seemed to be treated as a desperate last option. In hindsight I would happily have gone on to plan a vaginal birth without the ECV. Giving birth to a breech baby vaginally isn’t that different from head-down baby when the hospital staff is capable and you have a strong birth tribe. This entry was posted in Birth Stories and tagged doula birth by Eva Hussain. Bookmark the permalink.